This book came to the swap from Miss Scodioli, Scodioli.Etsy.com. 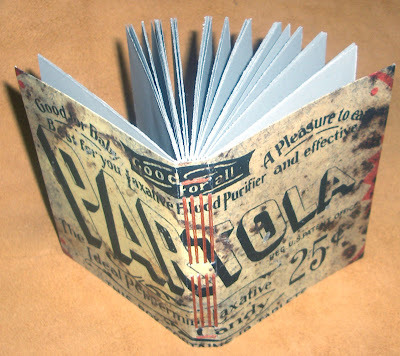 She describes this laxative sketchbook as one that is guaranteed to cure creative constipation! 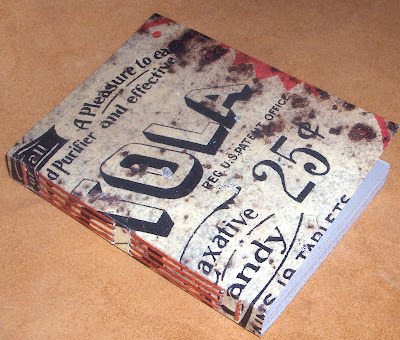 The cover is made using an image of an antique laxative candy container. The paper is Mr French Frostbite, 70lb text weight and there are schematics from a 1950s Science & Mechanics magazine used on the inside of the cover. She has bound the book in lovely constrasting red thread using combined longstitch and chain stitch. Visit Scodioli's Etsy Shop for more of her work. It is really fun! I was the lucky recipient of this book and I love it! I haven't decided what to use it for, but the inside paper is wonderfully smooth so it has lots of potential! Scodioli always finds such cool things to use for her covers.